I try to get out a post highlighting some great gift ideas for pop culture fans each year. This year posting was delayed by a number of different life events, but we still have a week of shopping left and most of the gift ideas I will be offering are either readily available or older classics. This device is a wonderful addition to any book lover's inventory. The Kindle Wireless Reading Device is lightweight, has a decent amount of memory, and Amazon has a lot of books available in digital format for the device. Additionally, sites like ManyBooks.net have a large catalog of public domain books available in Kindle format. 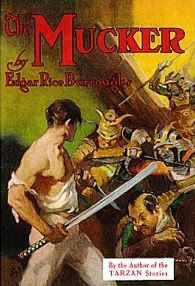 Is your favorite geek an Edgar Rice Burroughs fan who has been trying to hunt down a version of The MuckerThe Outlaw of Torn? Look no further than ManyBooks.net. The Kindle also has a pretty well kept secret. It's also a nice little 3G internet browser, with no monthly fees, where you can surf and even tweet. The internet fuctionality isn't on the par with an iPhone, but it's pretty good and keeps getting better. I have in mind here three excellent anthologies edited by Stephen Jones that are a wonderful addition to any fan of weird fiction's bookshelf. The first two are H.P.Lovecraft's Book of Horror and H.P. Lovecraft's Book of the Supernatural: Classic Tales of the Macabre . 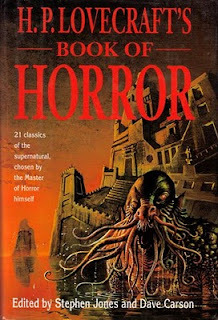 The Book of Horror contains Lovecraft's seminal essay on Supernatural Literature and a selection of stories based on Lovecraft's recommendations. It is a great companion piece to any Lovecraft library and contains many of the stories that inspired Lovecraft himself. The Book of the Supernatural lacks the essay, but continues the exploration of tales that inspired Lovecraft. Between the two books, you have quite a wide sample of early weird fiction. I would also recommend The Mammoth Book of Wolf Men , which was re-released this year in the hopes of riding on the wave of interest the upcoming WOLFMAN movie should generate. This anthology collects some excellent werewolf stories by authors like Neil Gaiman, Clive Barker, Hugh B. Cave, and Manly Wade Wellman. What's that poster you see on the wall of Sheldon and Leonard's apartment every week on "Big Bang Theory?" 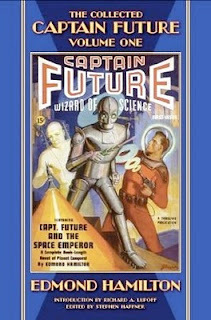 Who is this Captain Future: Wizard of Science guy, and what does he have to do with the joys of reading science fiction? Your favorite geek will be able to answer these questions and more after you buy him/her a copy of The Collected Captain Future Vol. 1 by Haffner Press. Captain Future was the creation of Edmund Hamilton who, along with Robert E. Howard and H.P. Lovecraft, was a key member of Farnsworth Wright's talented pool of writers during the heyday of Weird Tales magazine. The Captain Future stories were eventually converted into an anime series by Toei. The only question your favorite geek will be asking after reading this wonderful collection is, "does that poster belong to Sheldon or Leonard?" Remember when Little People were bizarre looking utilitarian representations of what humans? Remember when Little People were just the right size to fit into your mouth and chew on? Remember when Little People cowered in fear of the "Dread God (Insert Your Name Here)? John Kovalic and the good folks at Dreamland Toyworks certainly do. 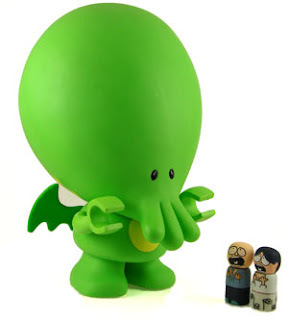 The My Little Cthlhu "action figure" is a wonderful blend of Kovalic's elegant cartoon style, and the design of the older -- now changed -- Little People series of toys. Any geek who wants to being introducing his/her children to weird tales and the joys of "The Mythos" absolutely must own one of these wonderful figures. Did I mention that Dreamland also makes "victims?" This November, Fantasy Flight Games released their much awaited, and much debated, Warhammer Fantasy Roleplay 3rd Edition game. The game is an interesting combination of mechanics drawn from narrative games, traditional roleplaying games, card games, and video games -- combined in a way to make the game easier to learn while maintaining a depth of play experience. If purchased at your "Friendly Local Game Store," the method I most recommend as FLGSs are what truly sustain the gaming hobby, the game comes in at a hefty $99.95 (you can buy it from Amazon at the above link for 37% less). The price seems costly at first, but like most role playing games Warhammer 3 has the potential to give quite a lot of entertainment bang for the entertainment dollar -- given the number of hours of play and the number of players supported by one box. 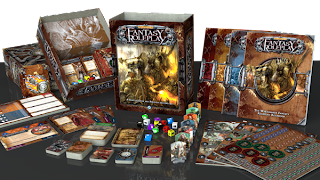 The graphic design of the product is excellent, the rules mechanics are easy to learn but robust, it supports both narrative styles and "hack n slash" style games, and FFG has a lot of interesting support products in the pipeline. On a side note, while the rules set was created specifically for the Warhammer "universe," I believe that the mechanics could be used for a wide variety of game settings. Translating the rules from one genre to another would be a bit of work, likely too much work for a GM to do in his/her spare time, but the underlying system would work wonderfully with a Superhero themed setting. Your post above about "Captain Future" led me to attempt to find books by E.E. "Doc" Smith.. Out of print! Except Kindle. Kindle is both the boon and bane of obscurity seekers, and I don't know how I feel about that. Certainly the likes of Paizo and Haffner will avoid releasing books that are available elsewhere for about $5.00.